last flight, Aug. 6, 2003.
" Plant 2" site in Seattle. On a hot, humid Wednesday in early August, the Clipper Flying Cloud touched down at Dulles International Airport near Washington, D.C., and the engines of the first fully pressurized Boeing commercial transport were shut down for the final time. 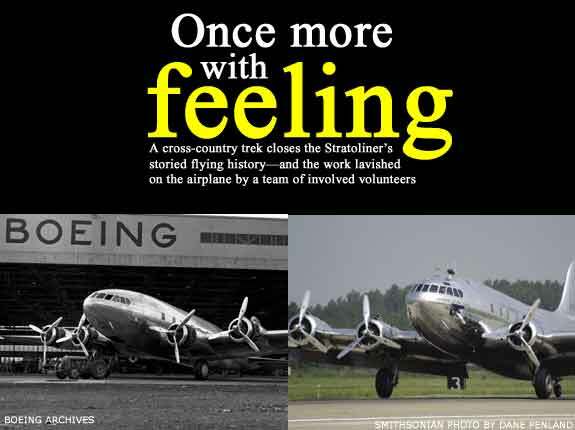 The Boeing S-307 Stratolinerthe only remaining flyable aircraft of its kindhad reached its final destination. For most of the engineers and mechanics who had labored lovingly to restore the piston-powered airplane to its former elegance, it was a melancholy moment. Their involvement with the Flying Cloud had become an affair of the heart, and it was coming to an end. The world's first high-altitude commercial airliner will be on permanent display at the Steven F. Udvar-Hazy Center at the Smithsonian National Air and Space Museum annex near Dulles airport. The center is scheduled to open in December. The Flying Cloud will never fly again. Since the 64-year-old airplane had been brought up from the Arizona desert in the summer of 1994, dozens of engineers, mechanics and aviation enthusiasts had lavished thousands of hours on the Clipper Flying Cloud to return it to its pristine condition. They had developed a strong emotional attachment. "She's special," they said, calling it "our airplane." "There's just a magic to this airplane," said Richard Hummel, a retired Boeing research mechanic and one of the volunteers on the restoration crew. "These old planes are very romantic." In fact, there was a magic to the airplane even when Boeing built it in 1940 for Pan American Airways. 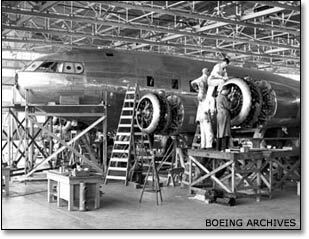 Boeing 307 Stratoliners were the world's first fully pressurized commercial airliners. They were able to fly at 20,000 feet, which was deemed "above the weather" at that time. Boeing built just 10 of them. And in 1940, the mere fact of flying was romantic, affordable only to the wealthy. The airplane's sumptuous interior, carefully restored, evokes that era. Walls are covered with walnut paneling and specially loomed damask. The roomy single-aisle seats are covered in blue leather, and the soft cloth compartment seats convert to Pullman-style beds. Once airborne, passengers were provided china-and-linen meal service. The Flying Cloud served a number of commercial routes before being commissioned into military service during World War II. After the war, it was returned to commercial service and then on to a succession of owners, including Haitian dictator Francois "Papa Doc" Duvalier. In 1969, it found a home in Mesa, Ariz., where the once-glamorous Flying Cloud was about to become a water bomber to fight forest fires. Instead, a Smithsonian curator recognized the airplane and acquired it. The Smithsonian had no place to show the airplane, however, so it was lent to the Pima County Air Museum in Tucson, Ariz., where it sat for more than 20 years in the hot desert sun. In 1994, Boeing made arrangements with the Smithsonian to restore the Flying Cloud, and a Boeing team brought the airplane back to Seattle, where the work was done in the original Plant II 307 production hangar by a team of volunteers and Boeing employees. Although the airplane had been made temporarily flightworthy for the flight to Seattle, the task was immense. The paint was faded and peeling; the cabin was stripped of all but a makeshift lining; hoses and tires were cracked; cables were rusted, and rivets were missing. If restoring the airplane was a labor of love, the endeavor required equal parts good footwork and good luck. From black-and-white photographs found in Boeing archives, the restoration crew knew that the fabric in the interior walls was specially loomed, showing a map of the world with Pan American's primary destinations marked with special symbols. But the photographs couldn't help them match the fabric color. Then, they tore off some old trim and found a tiny swatch of the original damask underneath. Working with that, the New York company that produced the material more than 60 years ago wove new fabric for the airplane. And after two years and countless hours prowling the Internet, crew chief Nate Andrews located two vintage compasses for the airplane. He unearthed other treasures, too, including an original Pan Am pilot manual and a 1942 route and flight schedule for the Clipper Flying Cloud. In March 2002, the restoration effort suffered a major setback. During a test flight, the airplane ran out of fuel, and pilot Richard "Buzz" Nelson was forced to ditch the plane in Elliott Bay in Seattle, just a few feet from a Coast Guard rescue station and in full view of diners at a restaurant. Crewmembers were not injured and walked onto the wing and into a rescue boat, but the plane sank. Heartsick but determined, in little more than a year the crew repaired the damage caused by the crash and the corrosive effect of salt water. At every juncture of the restoration, the affection the restorers felt for the airplane was evident. The public's love affair with the airplane was equally apparent. On the day the Flying Cloud left Seattle for the last time, a former Pan Am pilot, now 85, flew from Bend, Ore., simply to see the airplane one last time. When it taxied across Boeing field, Lynn Loomis stood at attention, pulled his slightly battered Pan Am cap from his head and placed it over his heart. His wife, Alice, 80, stood quietly beside him, her hand resting on his shoulder. "We wouldn't have missed this for anything," she said. En route to the Smithsonian, the Flying Cloud made overnight stops in Great Falls, Mont., and St. Cloud, Minn., then spent nearly a week at the Experimental Aircraft Association AirVenture show in Oshkosh, Wis. Everywhere the plane touched down, crowds gathered, wide-eyed and appreciative. In Oshkosh, it often seemed as if most of the estimated 750,000 at the air show dropped by to admire the vintage airplane. One man returned five times, recalled Hummel, the retired Boeing mechanic. Some people had stories they wanted to share about how they or one of their parents or grandparents had flown on the airplane. Others simply wanted to marvel at its polished aluminum skin and peek at the lavish interior. "The airplane is a piece of history and was a huge attraction," recalled Gary Dawson, a retired Boeing aircraft mechanic and a member of the restoration team. "Everyone wanted to know more about it." The trip gave the crew a little time to prepare for the eventual final, bittersweet parting. The Flying Cloud had been a dingy, decrepit airplane, and through their ministrations, the airplane became fully functional and luminously beautiful again. "The airplane has an incredible history, and in the past nine years we've been an intimate part of that," Dawson said, his voice cracking with emotion. "For me, it's been a centerpiece of my life for the past five years. But until we had to say goodbye, I don't think any of us realized how involved we'd gotten." "We brought her back to life." recalled Pat DeRoberts, a retired Boeing flight engineer and volunteer member of the restoration team. Before he left Dulles International Airport, DeRoberts walked across the tarmac, patted the airplane a final time, and kissed the Flying Cloud farewell.